1 GiB of SDRAM mounted in a personal computer. An example of primary storage. 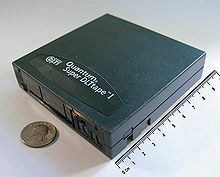 15 GiB PATA hard disk drive (HDD) from 1999; when connected to a computer it serves as secondary storage. ↑ 1.0 1.1 Patterson, David A.; Hennessy, John L. (2005). Computer Organization and Design: The Hardware/Software Interface (3rd ed.). Amsterdam: Morgan Kaufmann Publishers. ISBN 1-55860-604-1. OCLC 56213091. หน้านี้แก้ไขล่าสุดเมื่อวันที่ 19 กันยายน 2560 เวลา 02:23 น.